Last night we had enchiladas for dinner. 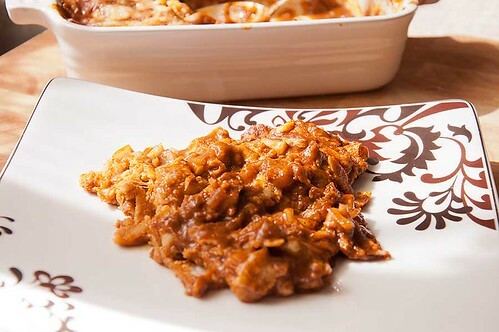 I used my Enchilada Sauce of Three Chiles recipe, was it every wonderful. Speecy spicy, but wonderful. 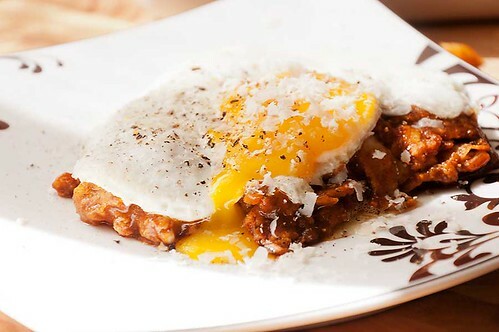 Chilaquiles topped with a sunny side up egg. 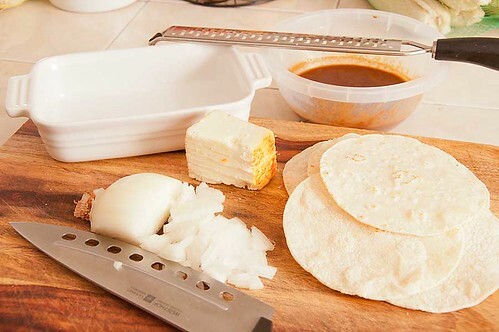 If your tortillas are still pretty fresh, you'll need to toast them to dry them out a bit. 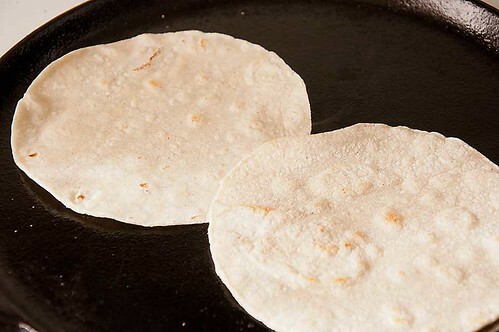 On a lightly oiled griddle or frying pan, toast the tortillas until they are dry and starting to crisp up. 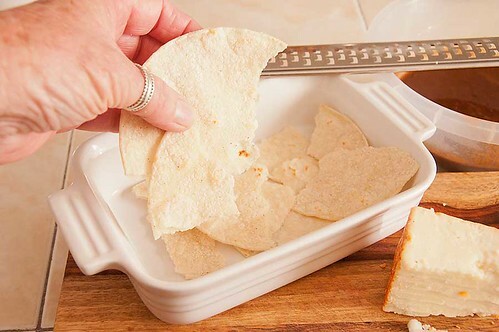 Layer the bottom of your baking dish with torn up pieces of tortilla. 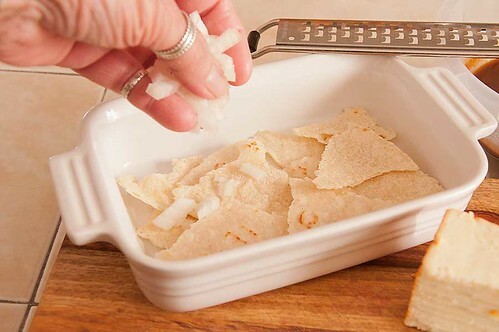 Add some of the diced onion. 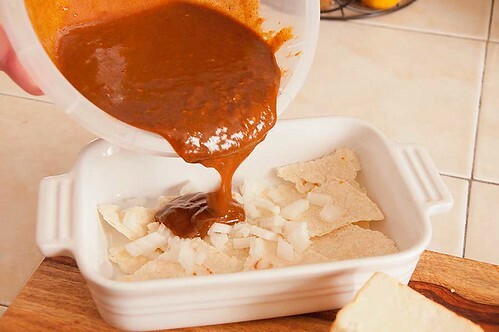 Pour on some enchilada sauce, just enough to cover the tortillas. 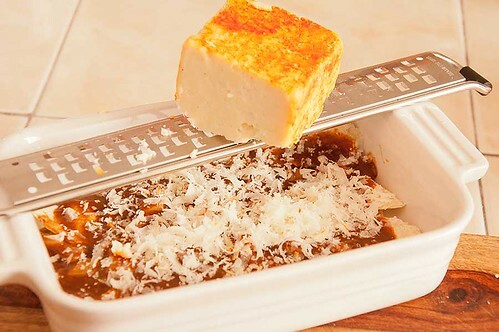 Grate on a good amount of cheese. 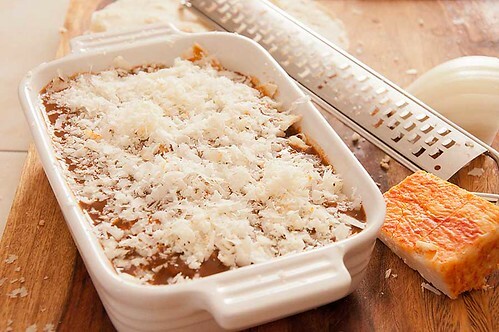 Then do it all over again, a few more times, to fill your baking dish. End with the sauce and cheese on top. Bake in a 350* oven until it's hot and bubbly. then top with your favorite style egg. When I made this sauce the other day, it turned our really speecy spicy. I can handle a lot of heat, and it's a pretty spicy sauce to begin with; I think the new batch of chili I bought was the culpret. It was pretty hot, even for me. If it's too hot for you, just add more chicken broth, about half as much, or more, according to your taste. 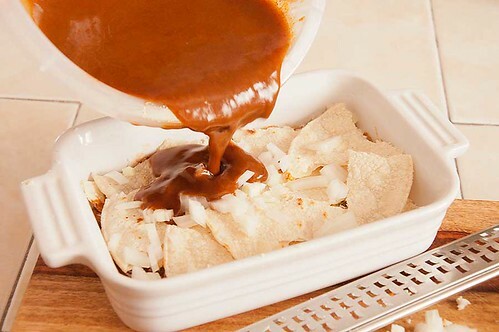 Then bring the sauce back to a low boil, and stir in the flour slurry, then simmer. It will still be great. cooking until the sauce thickens. then stir in the chilies. Add all the chicken broth or water.